The Navman N40i is simple to use and gives you access to its impressive functions quickly and easily and includes European street level maps on CD. 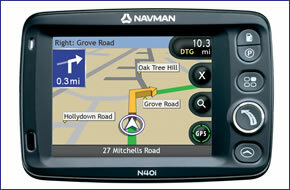 The Navman N40i uses NavPix technology, the world's only car navigation system that lets you navigate to pictures. With its built-in camera, you can shoot and build your own 'destination album' and navigate back to your favourite places simply by tapping the photo on the screen. Navman N40i has been discontinued. Accessories, spares and parts are still available for your N40i, as are Australian road maps. The Navman N40i satellite navigation brings together 3.5-inch touchscreen and NavPix functionality with a digital camera and accurate, reliable navigation in a cost-effective package. The Navman N40i includes European street level maps on CD, speed camera data, and also features 'Nearest Parking and Petrol buttons', an ingenious and useful extra exclusive to Navman. The Navman N40i includes an integrated digital camera for taking NavPix to create an unmistakeable reminder of your chosen destination. You can also download NavPix or share your own in the NavPix Library. So you can choose whether to use a NavPix or an address, including the postcode (even 8-digit UK postcodes), to find your way to a destination reliably and accurately every time. With the subscription-free Traffic Pack as an optional extra and pre-loaded speed camera data, the Navman N40i puts the pleasure back into driving and keeps you on the move. Navman's subscription-free RDS. TMC service sends up to the minute live traffic information directly to your device, enabling you to change your route and make traffic delays a thing of the past. The ergonomic 'Nearest Parking and Petrol buttons', combined with simple touch screen operation featuring 3D maps and voice guidance, make getting from A to B a breeze. The Navman N40i has been designed to be Plug & Play, and as such can be transferred from vehicle to vehicle with ease by the user. The Navman N40i is powered with a 12-volt adaptor cable in-car. The provided mains A/C power adaptor allows for use in the home or office, when configuring a route (cables included). The Navman N40i works with Tele Atlas Maps to provide European street level maps on CD. Tele Atlas Maps provide high quality, detail rich maps, which in addition to street information include features such as route calculation, Points of Interest, Estimated Time of Arrival, and more. Further Navman N40i maps are available SD card which insert directly into the Navman N40i. Available Navman N40i maps include, Western Europe, Eastern Europe, North America and Australia. View the complete range of maps available for the Navman N40i. Although the Navman N40i has been discontinued, a number of accessories are still available to buy from ActiveGPS. These accessories and spares include: vehicle power cable, windscreen suction mount , mains power charger, remote control, T1 Traffic Pack and external GPS antenna. Navman N40i maps with the exception of Australia have now all completely sold out. does it cost including Postage and packing to a London address? Answer: While we sell genuine Navman N40i accessories e.g. windscreen mount, car charger, etc. We have never sold internal parts e.g. screens, batteries, etc. I would recommend you contact Mio Navman directly on 0871 277 0139.